Believe me, I wanted to hate this album. I really did. After having heard the teaser “Unsustainable” about a month back, I was left scratching my head, and certainly not because it was too abstract for my plebeian musical tastes to process. As far as the single was concerned, it sounded like Muse had dumbed down their symphonic edge to the point where I could expect a bib and apron to come along with it. Adding insult to injury, superfluous dubstep influences were rampant, offering the sonic equivalent of having my brain fried in a saucepan. Considering that the other two singles (“Madness” and “Survival”) certainly weren’t much better in the songwriting department, I was actually rather looking forward to writing what I only imagined would be one of my most negative reviews yet. Of course, as it turns out, I greatly overestimated the sort of emotion Muse’s sixth album would conjure in me. 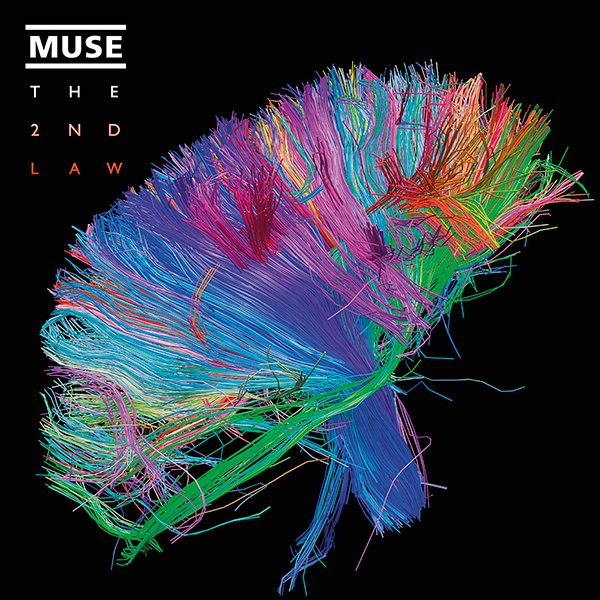 “The 2nd Law” is by no means excellent, but Muse’s outrageous approach to alternative rock is worth a certainly worth a spin, although the flash-over-substance dynamic suggests that it won’t remain a hot topic for long. Going back a little ways, Muse were a big band for me in high school. Before I had really opened myself to the ‘modern’ scene in progressive rock, Muse were there to offer a more streamlined experience, while still managing to bring that sense of bombast and arrangement. By the time “The Resistance” dropped and left me disappointed, I had already moved onto different things. “The 2nd Law” perpetuates some of the negative traits I saw in “The Resistance”, but there is a greater sense of inventiveness to the music than there was in 2010. Muse are still defined by a somewhat contrived combination of symphonic music and angsty alternative rock, although I’d argue a lot of the depressive feeling in their music has been rather diminished. In its stead, vocalist Matt Bellamy splits his time between singing about personal topics and heavy-handed politik. As was even moreso the case with “The Resistance”, Bellamy’s political material is cheesy and ineffective, although his voice is as powerfully operatic as it’s ever been. Muse aren’t necessarily expanding their boundaries on “The 2nd Law”, although there’s a surprising variety to the sounds and styles heard here. Barring the tired Queen-isms and shallow symphonic arrangements of the singles, Muse tend to incorporate these styles well. “Supremacy” sounds like it could either be a national anthem or soundtrack to the next James Bond film. “Panic Room” is the sort of dance-rock track I’d imagine gets played in trendier London clubs. “Follow Me” throws out all sense of rock, focusing instead on vocally- driven pop electronica, complete with the frustrating dubstep ‘wub’. There are plenty of experiments that don’t work, although there are a couple of gems here. The atmospheric “Animals” and the full fledged post-rocker “Save Me” are both excellent, and stand as being two of the greatest tracks Muse have ever done. Particuarly on “Animals”, the classically- derived melodies do not feel forced in the slightest; they allow themselves to get a little wild and even proggy without the overwhelming pretense that usually comes along with it. Bellamy described “Explorers” as a collaboration between Louis Armstrong and Meatloaf doing a post-metal track, and while I wouldn’t say it quite matches the promise, it’s an interesting enough ‘ballad’ track, highlighting Bellamy’s vocal skills. Speaking of vocals, bassist Chris Wolstenholme offers his vocals on a couple of tracks, including “Save Me”. Although he’s certainly not as distinctive as Bellamy, his no-nonsense approach is refreshing, especially after the majority of the album has been spent digesting Matt’s larger- than-life performance.